German Shepherd Payton looking good! His name is Payton named after the great Walter Payton of the Chicago Bears. He is between two and three years old. We got him through a dog rescue in Oklahoma. He doesn’t have a mean bone in his body. We have only had him 2 weeks. We have got him to sit, lay down, and stay. He loves everybody and is a joy to us already. He is a beautiful boy and I will never understand why somebody didn’t want him. It is if he has been dropped down from the heavens specifically for our family. Payton and my son who is 15 are best buds already. He also loves to ride in the car and play tug a war with his favorite towel. He has had a rough life at some time but is in good hands now. Please consider Payton for gsd of the month. Thanks so much for sharing the story of your rescued German Shepherd Payton with us. Congratulations on your new addition and I wish you many years of companionship with him - he is certainly a looker! And thanks so much for rescuing him in the first place. If more people took the time to rescue dogs in the first place then maybe the shelters could go out of business - or some of them anyways! 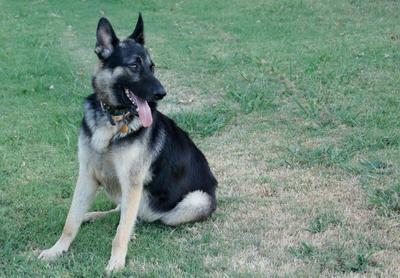 Rescuing German Shepherds, or any pet for that matter, is such a worthwhile thing to do. I wish more people could open their hearts to animals without a home. My most recent German Shepherd, Rodie, is a rescue too - I got him when he was about 4 months old. He's just over 2 now and is quite the character. So great job on the rescue, and thanks for the story share. I so enjoy reading all these stories and I know my readers love to read them too. Keep us up on Payton's future in your home and how he's doing. Thanks again! Frist let me say,"Congratulations" on your new addition to the family. The way I look at it; Payton is Wanted, he was on his way home to You,it just took a little longer and a couple of detours but he there, and that's the most important thing. Payton was Heaven sent, to a family who loves and adores him. You will see that German Shepherd are "something else" especially when their Protectiveness kicks in. Take care of your boy and he will take care of you! You can read our stories tgs puppy mia story, and Mia my beautiful german shepherd dog. German Shepherds - Top Dog!!! Thank you for placing Payton on you site. We have now had him 6 weeks and are in the process of finding a trainer. He is a handsome boy.